Learning that you are pregnant can come with waves of excitement and joy. For many mothers, including those that planned on it, this news can also come with fear and uncertainty. Birth mothers that are not ready to take on the responsibility of parenthood may find that options such as private adoption can provide the ideal solution for an emotionally complex problem. Today, adoption has become a popular choice for many families, providing the best life possible for the child. If you’re pregnant, reside in California, and are considering this option, A is 4 Adoption is here to help! Our adoption center is proud to offer the most comprehensive birth mother help to those who made a brave and loving choice. Today, we’ll discuss the three areas of support that we provide to ensure your pregnancy is as healthy and as stress-free as possible. The health of you and your baby are our top priority. Our team will work closely with you to schedule and organize all appointments related to your pregnancy. We understand that life can be hectic, and will develop a plan that best fits your needs. A is 4 Adoption is available to assist in finding prenatal care, scheduling your appointments, providing transportation to and from those appointments, working closely with hospital staff, and more. Our adoption center also takes care of the paperwork and logistics associated with a majority of your adoption plans. We’ll plan and coordinate meetings with prospective parents and doctors to ensure you are well cared for throughout pregnancy. A is 4 Adoption understands that choosing adoption is a major decision, and one that won’t come without strong emotions attached. We are here to create a positive adoption process for brave birth mothers, taking every step to minimize the stress and uncertainty of what’s going to happen. We also have a telephone hotline (1-866-5MY-BABY) that is available 24/7. Our guides will hold your hand every step of the way, providing emotional support the best way we know how. A is 4 Adoption will act as your advocate throughout the process, securing an ideal fit for you and your beliefs. If you have concerns, we understand. Call us today, and our adoption center will be able to discuss all of your available options. As your trusted adoption guides, we will be there through your labor (if you wish it) and beyond. Our adoption specialists work to secure funding for you throughout this process, including Medi-Cal and other government assistance programs. We work hard to create the most comfortable adoption process for you and baby, and will provide financial assistance for pregnant mothers in terms of housing, phone bills, transportation, utilities, groceries, and more. You have decided to undertake this amazing journey, and deserve to be cared for! We work to ensure that you have everything you need throughout the process, and will be happy to discuss our financial support plans. Contact us today to learn more! A is 4 Adoption is here to help deliver the most stable and comfortable environment for you throughout your pregnancy. We strive to deliver more than any adoption agency you’ll find in California. 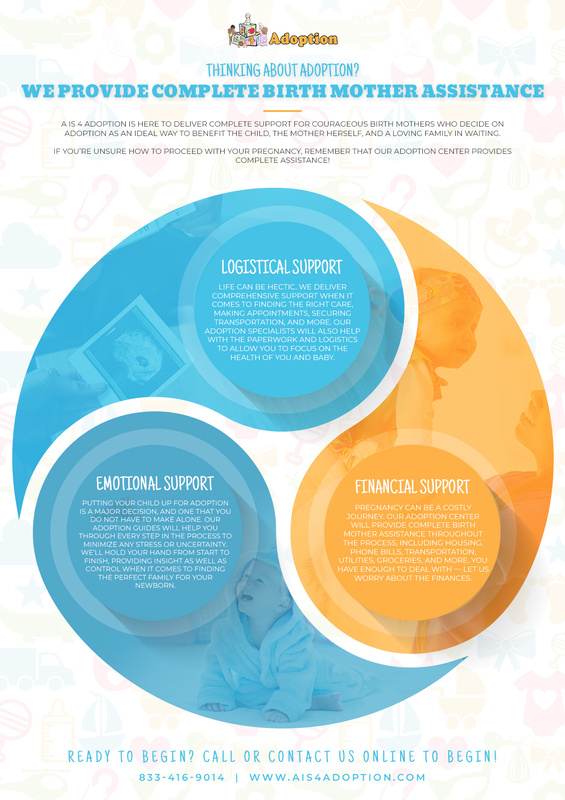 Our center works hard to provide the emotional, logistical, and financing support needed to ensure healthy outcomes for you and your child. Our team is here and always ready to help those in need of guidance. Pregnancy can be an emotional experience, and one that does not need to be experienced alone or without professional support. Contact us today to learn more about our approach to domestic infant adoption, and be sure to schedule an appointment with us to get started when you are ready.